The rapid growth in energy demand in the United States and abroad makes fossil fuels essential for continued economic growth and human well being. But using these fuels produces the greenhouse gas carbon dioxide. Geologists have much to contribute to one possible solution. A saline aquifer in the North Sea is one of two large projects in action for storing carbon dioxide in geologic formations. At the same time, companies and governments in several countries are teaming up to understand a range of storage methods, from burial in coal seams to making carbonate rock. A look back at the National Earthquake Hazards Reduction Program on its 25th birthday. This years American Geological Institute Congressional Science Fellow brings his background in economic geology to the policy arena. A new partnership will bring an earth-science curriculum and valuable teacher training into Los Angeles schools. 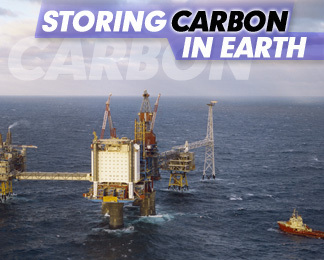 This illustration shows how carbon dioxide is injected into a saline aquifer beneath the Sleipner West gas field in the North Sea. Natural gas is extracted, carbon dioxide is produced and, in turn, the carbon dioxide is injected back into the underlying aquifer. Learn more from this month's two feature stories. Photo supplied courtesy of Statoil.